Specialist Lifting Solutions are trained specialists in the installation, testing and removal of Everhot Range Cookers. We have had a long-standing contract with Everhot for over 7 years for which to deliver, install and reposition the Electric Range Cookers. The Everhot Range Cooker is designed to be moved with ease if you decide to relocate. - Properly protecting your range during transport with specially designed padded covers. It is advised that if you choose to relocate your cooker, that you use a specialist transport company like Specialist Lifting Solutions. 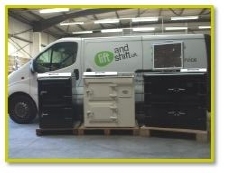 Specialist Lifting Solutions have years of experience in moving Everhot cookers as well as all the training and expertise needed to navigate round corners and up and down stairs whilst supporting the weights specified above. Specialist Lifting Solutions also buy and sell used everhot cookers! Call today free for more information. Specialist Lifting Solutions are fully trained to restore used Everhot cookers to the original factory settings and finish. We have had over 7 years experience of refurbishing Everhot Cookers, as well as a long standing contract with Everhot for which to deliver and install their cookers.